Opening Day? There’s a blog for that. Opening Day is right around there’s a blog for that. Introducing OPENERS, which we just launched this week. We’ll be counting down the days and posting around the clock through the final home openers. 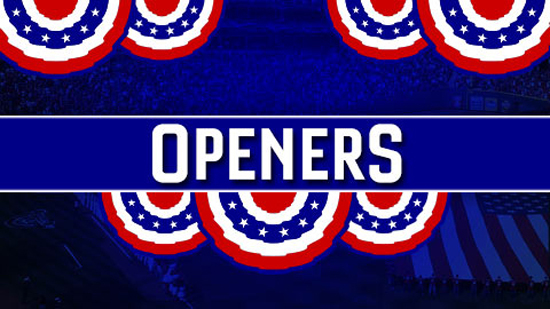 It’s the only place to find all of the announced Opening Day starting pitchers (we add each time there’s a new one), it’s a repository for injury updates, it’s where you’ll find classic Opening Day quotes, what’s new in 2015 ballpark concession fare, video team previews, and tons of content from the only network of 30 traveling beat writers, our MLB.com columnists, MLB Network talent, great photographers and much more. It is integrated with our social team featuring tweets, and you’ll want to include #OpeningDay on your social posts. Please give it a follow in the widget on the right side of the blog, and leave comments here so we can highlight your own content along the way as well. Opening Day…almost here. The blogging around here is heating up along with the weather. With exciting rookies, breakout performances, the First-Year Player Draft, All-Star voting and the customary thrill of baseball season, there’s certainly plenty going on. We had some promising debuts of our own recently, with the likes of The Halo Way, From the Reds Hall, and Vottoshop Wednesday. Join them by making this the month you start your own blog and take advantage of the relationship between MLB Advanced Media and WordPress.com. Participate in our community, build an audience, and you’ll be appearing here in the Latest Leaders before long. 37. Why Did My Dad Make Me a Mets Fan? 44. You’re Killin’ Me, Smalls! We’re into the final third of the season at MLB.com/blogs and the Trade Deadline has passed. Not surprisingly, the Trade Buzz behemoth rode that excitement to the overall top spot, as MLB.com’s team of beat writers kept us all up to date on the very latest on the trade front. Elsewhere in the MLB PRO Division, Camille Campins Adams, wife of Yankees prospect David Adams, jumps past Mitch Williams to make her Latest Leaders debut with My Serendipitous Life as a Baseball Wife. While the Oakland A’s have blossomed this season, so has A’s Farm, which continues to climb the FAN rankings all the way now to sixth. July was a big month for Cubs 1B Anthony Rizzo and also for Cubs beat writer Carrie Muskat, who cleans up in the Beat Reporter standings. Congratulations to all who made the list, and remember to always leave your full URL with comments here and use TW/FB widgets to help grow your following. 19. You’re Killin’ Me, Smalls! Good news for everyone who maintains an MLB.com Blog: You can easily embed and share MLB.com and MLB Network videos in your posts now, as Jamie Ramsey and Marty Noble have done. Look for clips that say “EMBED” among the Share icons under the video, and then copy the code. In your WordPress dashboard text field, click the HTML tab and simply paste the code where you want. Let’s say you want to post a Barry Larkin HOF video. Search our video for Barry Larkin and find http://mlb.mlb.com/video/play.jsp?content_id=20052845&c_id=mlb – then you see the grey “EMBED” button under the video, and just copy that html code. If you don’t see the “EMBED” button on one of our clips, it is not available for sharing yet. I just went to our Video home on MLB.com and searched for “MLB Network.” Freddie Freeman is talking about his time with the Braves so far. Sounds like a good blog post for someone on MLB.com Blogs, sharing your own view on what it has been like watching him as a Brave so far. I’m embedding the video…easy stuff…here you go. Text, videos, pics, polls, comments, awesome dashboard — lots of reasons why you need a blog in 2012 besides that Twitter and FB account. 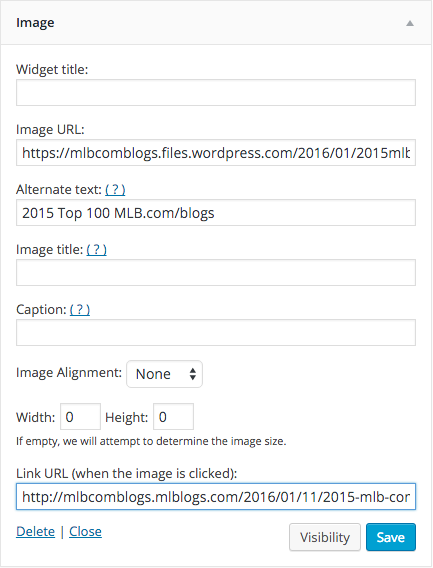 Use Twitter and FB to get people to your blog so they can see a nice-sized video player with MLB.com video, and add TW and FB widgets to your blog. It all works together…now with video. As you may have read below, Bloomberg and MLB.com have entered into a partnership to launch two new state of the art analytic products, one for the professional teams, and one for fantasy sports and general interest. We delivered the professional product to the teams at the Winter Meetings in Indianapolis for a six-month trial, and the response was very strong. The consumer product designed for fantasy players and avid fans will launch in mid February. Bloomberg will be hosting an invitation-only event in New York on Sunday, January 31, to give a sneak peek at the consumer product to key baseball media, to get feedback before it goes to market. The meeting will take place on Sunday so that those interested in coming from out of town would be able to join, with enough time to take everyone through the product step by step. Food and drink will be served. We would like you to join us for the event and get a preview of this fun, innovative, state-of-the art tool that will grow both the fantasy baseball market and overall interest in baseball. An outline of the product, as well as preliminary press reaction, can be seen at www.bloombergsports.com. Seating for the event is limited, so if you would like to join us please respond for further details and credentialing. Thanks for your time and interest, and we hope to see you on January 31. Please RSVP to Joe Favorito at bbsports@bloomberg.net. We hope you are enjoying the off-season and all the Hot Stove talk that is starting to build during the winter meetings and beyond. You may have heard recently about a new product for Fantasy Baseball that Bloomberg and MLB.com are readying for the 2010 baseball season…a product that takes player analysis to a new level, and will be a lot of fun for fantasy players. Here is the link to a story about the product in the New York Times. The BLOOMBERG SPORTS(TM) team wants to be sure that you are aware of the product, as someone who is passionately involved in the coverage of baseball. We will be reaching out to you to sample the service and get your input before it is available to consumers. The feedback of those who follow the sport so closely is invaluable to Bloomberg in building the best tool ever for baseball fans. We are organizing an invitation-only event in New York City in late January for a group of the most influential baseball writers who would like to learn about the development of the product and the technology behind it. We hope you will be able to join us for this event, where you will get a complete walk-through of the new service and a free subscription to these analytical tools. We hope to see you in January, and we know you will be impressed by this one-of-a-kind product. Make sure you put the brand-new Trade Talk blog on your browser toolbar strip or save the RSS feed to your blogreader — whatever it takes to make this an around-the-clock fixture in your life between now and the July 31 trading deadline. It is constantly updated by our 30 Major League Baseball team correspondents here at MLB.com. We’re the only media outlet that staffs every MLB press box with two dedicated beat writers on a traveling basis, and they are at the source of discussions with the general managers and player personnel folks. They are also routinely talking to each other and asking the right questions of those execs, knowing each club’s up-to-date needs and stances on the issues. Jump into this blog with your comments, ask your questions, tell them and others what you are hearing in the rumor mill as well, and make Trade Talk a staple in your trading season life. Welcome to Phillies Red Pinstripes, who started an MLBlog this month. We also want to thank that blog’s author for providing the link back to our All-Star coverage index area from the reposting of my colleague Ken Mandel’s article about Chase Utley’s All-Star voting update. With that AP settlement case involving The Drudge Retort in the news recently, it’s worth pointing out that common courtesy here. The MLBlogs Network has an “official affiliate/unofficial opinions” relationship to MLB.com, but please just credit and put a link back if you do reproduce one of our writers’ articles from MLB.com and the 30 club sites. Welcome also to our newest MLB PRO BLOG: Redlegs in the Community. The fact that so many clubs want to create blogs and audiences that way only further demonstrates the growing trend that everybody in baseball has to be blogging. Personal note Part I: It’s time to start another New York City Marathon training program, now that it’s coming upon 16 weeks out from the November 2 event. Base is around 23-25 miles/wk right now. Updated the running blog, too. Any runners out there, please feel free to hit me up with great suggestions and network. Post some of your own videos and comment with examples here.